A lot of value wine is featured in reviews, and even more in the newspaper column, on Grape Sense. But like most people I save the ‘good stuff’ – which can also be interpreted as more expensive – for friends or the weekend. With rare warm weather, near 60 degrees, it seemed like a good night to grill a nice Angus ribeye. So with steak getting friendly with the sea salt and fresh ground pepper, it was time to rummage through the wine rack. A Chilean Cabernet perhaps? 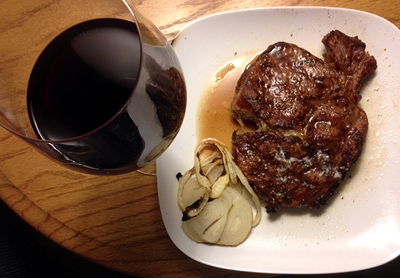 Maybe, a big California meritage-style wine would be a great match with the steak and evening sipper. On the third shelf of the rack was two bottles of Peterson Dry Creek Sonoma Bradford Mountain Zinfandel. It was a gift through a work contact. That sounded great so one was opened and decanted a bit. It was big and beautifully rich red wine that really hit the spot. It is a blend with mostly Zin, and just sa splach of Carignane, and Mouvredre. It has pretty serious alcohol at 15 percent. Rich red fruit, chocolate, and a nice spicy/pepper finish makes the Peterson Zin a California (Sonoma) classic. If you like big and rich, the Peterson Zin really hits the spot. I liked the big smooth fruit that didn’t clobber my palate like some Zins. And, frankly, was suprised to see the alcohol was 15.3 percent. I didn’t get any burn on the finish. The quality of small production wines are tough to beat. Peterson made just 375 cases of this wine from the 2010 vintage. I visited Peterson briefly during a spring 2012 visit to Sonoma. It is in the same hilltop location with Indiana’s Erik Miller’s Kokomo Vineyards and a couple of other tasting rooms. 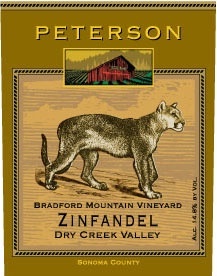 Peterson Winery, Dry Creek, Bradford Mountain Zinfandel, $38, Very Highly Recommended.